Chicago receives: Andrew Bynum (who has since been waived), Sacramento’s first round pick (top-12 protected this season and top-10 protected through 2017 then turns into a second-rounder), rights to swap 2015 first round picks with Cleveland (if the Cavs make the playoffs), and Portland’s second round picks in 2015 and 2016. 2011: Traded Mo Williams for Baron Davis and their 2011 No.1 pick, which landed Kyrie Irving. In June, Cleveland traded J.J. Hickson to the Kings for Omri Casspi and a first round pick. That’s the Kings’ first-rounder that Chicago received, which looked more valuable back then than it does now. Sacramento has picked fifth and seventh in drafts since then, and they’d be fourth in the 2014 Draft if the lottery balls don’t alter their position in either direction. That doesn’t bring a lot of hope going forward, but Sacramento has both a new owner and another batch of young players that can hopefully rise up from the West’s cellar, or at least high enough to bag roughly 35 wins sometime before 2017. That’s definitely possible with a top-five pick this year, even with the absence of defense displayed by the squad and Rudy Gay‘s player option that makes a rebuilding team more expensive than it should be. 2012: After trading Sebastian Telfair and Delonte West for Ramon Sessions, Ryan Hollins, and a 2013 second-round pick, the Cavaliers shipped Sessions to Los Angeles for Luke Walton, Jason Kapono, and their 2012 first-round pick. The pick became Jared Cunningham, which was then traded with Jae Crowder and Bernard James to Dallas for Tyler Zeller. That didn’t turn out so well, but Cleveland nonetheless traded players with little value in their organization for assets. The draft pick looks especially peachy for Cleveland from 2017 to 2019, when Marc Gasol and Mike Conley will either be approaching 30 years of age or into their low-30s if they stick with Memphis for that long. That’s a long time for Cleveland to wait for that draft pick, but it could be a great prize if Memphis goes through a rebuilding phase over those three years. Besides, if Cleveland gets that pick in 2015 or 2016 then it’s in the 6-14 range. It’s yet another high draft pick for a squad that’s had a ton of them lately. That’s where Cleveland has gone wrong since The Decision, though. The trades Chris Grant made were fine, but they don’t make up for the draft blunders that have plagued the organization ever since selecting Tristan Thompson fourth overall in 2011. It’s led to a trickle-down effect, one that led to the trade last night when Cleveland finally found a (expensive) small forward to add to their core of Kyrie Irving, Dion Waiters, whatever improvements come from Tristan Thompson, and whatever that makes Anthony Bennett not so horrible. But Deng will be one of the oldest 29-year-olds in the league when Cleveland has to decide on re-signing him or not. Deng’s played nearly four seasons under Tom Thibodeau, dog years compared to any other coach and he’s been in the league since he was 19. 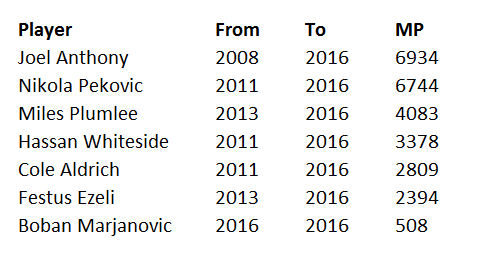 There’s also a fine line between giving a player with his mileage a three-year deal and one that’s four. $36 million for three years sounds a lot more desirable than $45 million for four, as the last of the latter contract could be albatross-like while the former becomes moveable fairly quickly. There’s also the good and bad that comes with an aging player like Deng who, as Zach Lowe of Grantland noted, doesn’t rely on jaw-dropping athleticism but can barely get separation on offense as is. Lowe also makes a good point on a possible four-year contract with Deng in that some of the money in the last season should be non-guaranteed. Cleveland also has to address their expiring rookie deals, the soonest being Irving’s and Thompson’s. Waiters’ contract looms the following season, though he and Anderson Varejao have been trade chips for a while now and could be gone by February of 2015. The Cavaliers still have plenty of draft picks, one not mentioned already being Miami’s 2015 first-rounder, protected 1-10 through 2016 and unprotected in 2017. It becomes very nice if the Heat break up their core after this season and rebuild, though Miami rebuilding for more than one season seems like a long shot given their franchise history, geography, and if Pat Riley stays with the franchise. For Chicago, they gave themselves an opportunity to land a top-10 pick, move Carlos Boozer for whatever they can get back in a trade (Chicago, always conscious about saving money despite being in a huge market, probably isn’t up for using the amnesty clause which would pay Boozer not to play for them), and open up playing time for Nikola Mirotic as soon as next season. Chicago’s not rebuilding as much as they are reloading, even if it means losing not just Deng but also Boozer by next fall. While the haul for Deng was one of Chicago’s best financial ones possible, it isn’t exactly the greatest they could’ve received in terms of value on the court. Sacramento’s pick might be a coin flip on whether or not it ever falls out of its top-10 protection, swapping picks with Cleveland sounds nice until the best they could move up to is 15th overall (still valuable, though), and the second rounders from Portland suddenly look like they’ll be in the 50-60 range in 2015 and 2016. Chicago might’ve also booted Charlotte from the playoffs with this trade, a big deal when the Bobcats owe them a draft pick with top-10 protection. At 15-20, the Bobcats currently have the NBA’s 12th-worst winning percentage but are seventh in the East. But with Cleveland having the pieces to make a playoff push and New York and Brooklyn resembling professional basketball teams again, both Charlotte and Chicago look like they’re headed for the lottery. That could be as much of a good thing as it is bad, though, as Charlotte’s protection on their pick they owe Chicago is only top-8 in 2015 and unprotected in 2016. It’s another potential ripple effect from a trade that has more long-term risk than short-term. 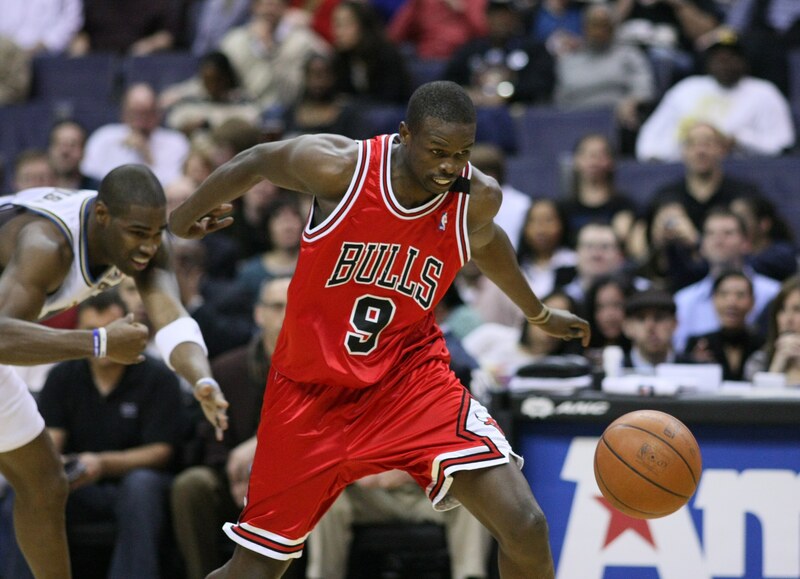 Overall, you can make a case for either side of the Luol Deng/Andrew Bynum trade being good or bad. Getting the best of their returns is dependent on what happens this summer. That’s when Chicago hopes to rebuild through the draft, all while Cleveland sacrificed their own draft position so they could land a premier wing to play alongside Irving both in the short-term and long-term. Until then, another chapter in this trade that will occur sooner involves the careers of Carlos Boozer and Andrew Bynum. Each has the potential to swing the fortunes of a contender while Chicago and Cleveland dwell in opposite sides of “mediocrity”.